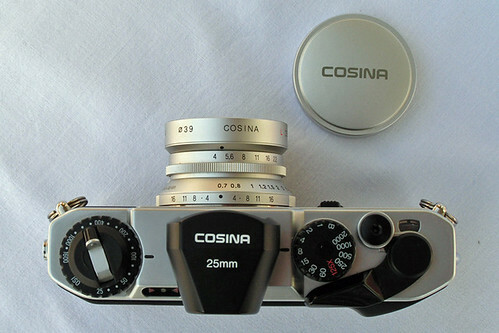 The Bessa 35mm cameras are manufactured in Japan by Cosina as a revival of the Voigtländer brand name. All the Cosina Voigtländer Bessa models have a double focal-plane shutter with two sets of curtains to prevent damage by the sun. Shutter speeds range from 1 to 1/2000s and bulb (B), with flash sync at 1/125s on hot-shoe or PC terminal. They all have TTL exposure metering, and manual exposure; the recent R2A and R3A also have an aperture-priority automatic mode. The Bessa L was intended to be used with ultra wide angle lenses, with which the absence of a focusing device is not a problem. 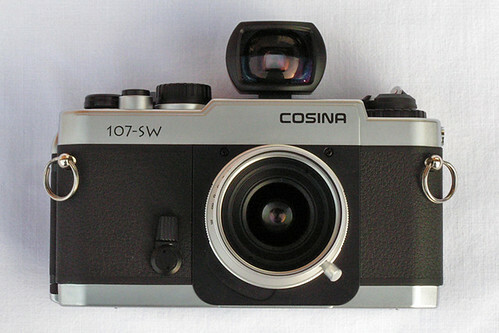 Most notably Cosina introduced a 12mm lens, the widest rectilinear lens ever marketed. The Bessa L has TTL metering with LED readout on the back edge of the top plate with an ASA range of 25-1600 and an EV range 1 to 19 at ASA 100. The readout consists of two red arrows pointing to a green light in between. In Asia, the Voigtländer Bessa L was first sold as the Cosina 107-SW in a limited number and hence this version is slightly rarer to find today. Most came with the Skopar 25mm f.4 snapshot lens, a very convenient super wide lens - hence the camera name SW for super wide. There were also limited editions made of both the Bessa-L and the 107-SW in a series of colour bodies in grey, olive, red and blue. The standard colours are metallic silver and black. The Bessa L was supplemented in 2001 by the Bessa T, which used the Leica M mount, could have a trigger advance attached to its foot, and had an integrated rangefinder with high magnification, but lacked a viewfinder. It was sold in silver or black; from 2002, also in gray or olive (at a higher price and perhaps only in Japan). It is now discontinued. In 2001, the Bessa T was sold in a special set, called 101st Anniversary (in short "T101"), with a 50mm f:3.5 collapsible Heliar lens, for the anniversary of the Voigtländer Heliar lens design. It existed in black, grey, olive and blue: five hundred numbered examples were produced for each color. The lens is particularly highly regarded. The Bessa R, introduced in 2000, is a rangefinder camera with a projected frame finder and a Leica screw mount. Although considerably cheaper than a Leica M camera, its viewfinder is comparable in function and feeling. It has manually selectable frames for 35mm/90mm, 50mm, and 75mm lenses. The body, made of polycarbonate plastics, is not comparable to that of a Leica but is solid enough. It cost much less than a comparably equipped Leica M camera. It was available in black or silver; from 2002, also in navy blue or olive (at a higher price and perhaps only in Japan). The Bessa R2 replaced the Bessa R in 2002. 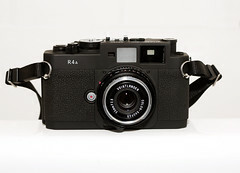 It is an updated version, with a Leica M mount replacing the Leica screw mount, and the ability to take the same trigger advance accessory as the Bessa T. Its quality of fabrication and overall finish is better than that of the R, with magnesium alloy replacing the former model's plastic plates and a more substantial cast (as opposed to pressed) metal film rewind lever. The changes resulted in a more solid and marginally larger camera, available in either olive (with chrome detailing) or splatter-textured black paint finishes. The Bessa R's self timer was deleted from the R2, possibly due to the packaging constraints imposed on the design by the adoption of thicker metal panels. The names Cosina, Voigtländer and Bessa appear nowhere on the Rollei 35 RF (2002), marketed not by Cosina but instead by Rollei. But this camera is very obviously based on the Bessa R2. The most obvious differences are the price (much higher) and somewhat gaudy appearance; more importantly the framelines are for 40, 50, and 80mm. Arguably it remains the best Bessa camera for people who wear glasses and primarily use a 40mm lens. The Bessa R2S and Bessa R2C are special versions of the Bessa R2, introduced in 2002, the R2S having a Nikon rangefinder mount and the R2C a Contax rangefinder mount. They are both discontinued today but stock is still available. At about the time in 2005 when discontinuation of these two models was announced, the Bessa R2S was also available in a "Nikon Historical Society" version with special paintwork and a rigid version of the Heliar f/3.5 50mm lens sold earlier with the Bessa T. The set was (and as of May 2006 still is) available to the general public through regular retail channels in the US: Society membership is not required. 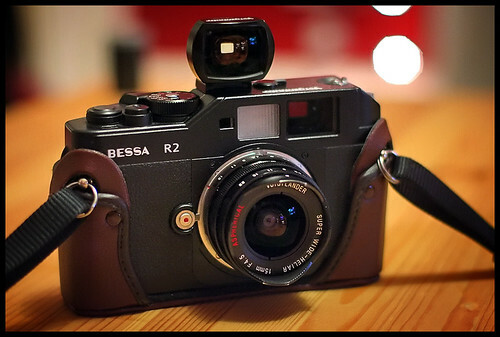 The Bessa R2A and Bessa R3A, both introduced in 2004, are the current models in the Bessa line. They are both updated versions of the Bessa R2, with the Leica M mount and an aperture-priority automatic exposure, switchable to manual. The R2A has a finder with a 0.7x maginification, and 35/50/75/90 frame lines. The R3A has a finder with a 1x magnification, and 40/50/75/90 frame lines. Both can take the trigger advance accessory. They are currently sold in textured black or flat grey paint finishes. 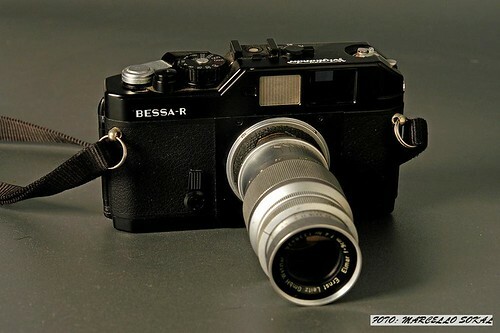 The Bessa R2M and Bessa R3M, both announced in Germany around March 2006 and in May elsewhere, are limited-edition manual-exposure, mechanical-shutter equivalents of the R2A and R3A, sold with a 50mm f/2 M-mount collapsible Heliar lens. The exposure display in the finder is more elaborate than that in the R2. They are to be sold in black (1000 examples of the R3M, 500 of the R2M) or silver (700 of the R3M, 300 of the R2M). 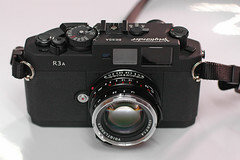 The Bessa R4A and Bessa R4M are wide-angle equivalents to the R2A and R2M respectively. They have 21/25/28/35/50 framelines. No alternative from any other manufacturer has yet (2011) offered a design with integrated view/rangefinder for such wide lenses. ↑ "Bessa R2S 'NHS' kinen moderu ga Amerika de hatsubai". "Bessa R2S 'NHS' kinen moderu ga Amerika de hatsubai". (ベッサR2S「NHS」記念モデルがアメリカで発売, Bessa R2S "NHS" commemorative model for sale in America). Kamera Rebyū: Kurashikku Kamera Senka (カメラレビュー クラシックカメラ専科) / Camera Review: All about Historical Cameras no.76, June 2005. ISBN 4-257-13078-4. Kurashikku kamera katachi to kinō 'supuringu kamera hen' (クラシックカメラ形と機能「スプリングカメラ編」, special issue on spring cameras). P.96.